4 wire testing, capable of testing exreame low resistance. Accurate measurement of conductor,electric heading elements and solder point. HOLD key for data hold. Connection for exernal power supply. High measurement range of 0.01mΩ to 2kΩ at 6 ranges. Backlight LCD for easy reading under dark light. Strong anti-magnetic and anti-jamming functions. HTC MO-5000 Digital Miliohm Meter is a premium quality Digital Micro Ohm Meters from HTC. Moglix is a well-known ecommerce platform for qualitative range of Digital Micro Ohm Meters. All HTC MO-5000 Digital Miliohm Meter are manufactured by using quality assured material and advanced techniques, which make them up to the standard in this highly challenging field. 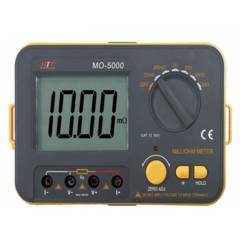 The materials utilized to manufacture HTC MO-5000 Digital Miliohm Meter, are sourced from the most reliable and official Digital Micro Ohm Meters vendors, chosen after performing detailed market surveys. Thus, HTC products are widely acknowledged in the market for their high quality. We are dedicatedly involved in providing an excellent quality array of HTC Digital Micro Ohm Meters.